I’ve used this notebook for a few days and have no regrets purchasing it. Vista runs pretty well after a 2GB upgrade and has caused no trouble while using it. Most of my programs worked flawlessly when installed. It’s slim enough to be carried around for a desktop replacement and certainly wowed my friends. The screen is great, the keyboard works well, and I wouldn’t trade it for anything else. I do wish there were more battery life, but it’s not possible to have everything! The dv9000t provides great desktop muscle plus one-touch music, photos, and movies. A Media Center laptop is a PC with multiple personalities. It's a desktop replacement, a portable, and, ultimately, it's a living-room entertainment system. Three months ago, I reviewed the HP Pavilion dv9000t ($2,569 direct), but hesitated to give it an Editors' Choice, thinking that a better Media Center laptop was in the works. It never happened. One alternative I had my eye on, the Toshiba Qosmio G35-AV660, had a long list of A/V features that could make anyone salivate, but it turned out to lack many of HP's finishing touches, especially when it came to high definition. Now, with the latest iteration of the HP Pavilion dv9000t (now with Vista) clearly having the best HD playback software developed for the included HD DVD-ROM drive, not to mention a neat little remote that fits in the ExpressCard slot, I'm ready to hand it the Editors' Choice. If that doesn't convince you, maybe the fact that all the cool features in the newest dv9000t are neatly tied together by Microsoft Windows Vista Ultimate will. 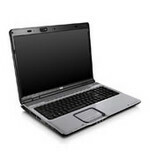 The HP dv9000t is the most powerful model HP has to offer with its crisp 17" screen, Core 2 Duo, dual-hard drive capabilities, and GeForce Go 7600 graphics card. The dv9000 is a gorgeous desktop replacement machine with enough power and features for nearly any user. It is definitely one of the best buys on the market for the money, and I would highly recommend it to anyone looking for a 17" notebook. The HP Pavilion dv9000t is one of the best choices you have if you want a multimedia center in a small package. The new processor, the discrete GPU, the great connectivity and the fabulous design, make out of the HP Pavilion dv9000t a no brainer when it comes to this kind of laptops. Of course, the price may seem peppered to many, but considering its capabilities, it is a good price. 85% Big desktop replacement model includes an HD DVD drive. The dv9000t is HP's new entertainment laptop with a 17-inch high-definition screen and a combo HD DVD player/double-layer DVD burner. With the dv9000t, you can stash hundreds of photos and MP3s on up to 240GB of storage provided by dual hard drives. You can also enjoy music and crisp movie dialogue from good stereo speakers, or listen privately with a friend using the dual headphones port. Online, you can personalize chatting with the optional integrated Webcam. Pricing for the dv9000 line is very flexible, starting at $879 for the dv9000z with an AMD processor and a single hard drive, and topping out at around $2700 for an Intel-based dv9000t with all the trimmings. Our $2530 (as of 11/6/06) dv9000t review unit featured a 2-GHz Core 2 Duo T7200 processor, 2GB of RAM, XP Media Center Edition, dual 100GB hard drives, a 256MB nVidia GeForce Go 7600 graphics card, and the HD DVD drive. 80% A slick and fast desktop replacement that offers high-definition DVD playback. Speed, storage, and good looks are served up in generous portions on the 7.8-pound HP Pavilion dv9000t ($2,394, as tested), which sports an Intel Core 2 Duo Processor, dual 100GB hard drives, and a glossy 17-inch screen. The icing on the cake is the HD-DVD drive, which plays a growing number of high-def movies, though not at the highest resolution. With effectively the same design as the dv6000t, the dv9000t offers a shiny black coating and sleek silver inside, with an imprinted pattern on both surfaces. This large, attractive notebook can handle anything from standard office tasks to photos, music, and DVDs—or better yet, all of the above. Its speedy 2.16-GHz Core 2 Duo T7200 processor lets you perform multiple tasks simultaneously, such as running a virus scan or installing program updates while watching a DVD, without interruptions in the audio or video. PC manufacturers are constantly striving to get Media Center laptops into your living room, and the integration of technology trends such as high-definition media content will only speed their passage. The HP Pavilion dv9000t is a fine example of what the future will bring. With a built-in HD DVD drive and the latest Intel Core 2 Duo processor, this Media Center laptop is poised to share space with your couch. If you're at all familiar with HP's latest Pavilion laptop line, you're aware that it has undergone a major design overhaul. Like the smaller Pavilion dv2000z and dv6000t models, the dv9000t's subtle, wavy patterns and finish help the line stand out from other consumer laptop designs. With the HD-friendly Pavilion dv9000t, HP shows that it continues to take entertainment seriously when designing its laptops. The latest iteration of the desktop replacement incorporates a bevy of high-end components, such as a Core 2 Duo processor, discrete Nvidia graphics, and a built-in HD-DVD drive, into its lightweight case. Add in the dv9000t's sleek design, with its echoes of consumer electronics devices, and you have a system that will look as good in the living room as on the desktop. While the new processor didn't add up to the greatest performance we've seen (that distinction belongs to more gaming-oriented systems, such as the Dell XPS M1710), the HP Pavilion dv9000t is a great choice for home users who want their laptop to double as an entertainment system.